Are you in search for the best stand mixer? We compiled a list of the five best models from among those that are in the market this year. We are after performance, not looks or popularity, in this search because like all home cooks, I’m sure that you, too, desire a stand mixer that will do anything and everything that you need for it to do. It better do so because, nowadays, a good counter top mixer doesn’t come cheap. A number of brands and models are competing for your attention and your money. Although, there is not one absolute best stand mixer for everyone, a few stands out. I like this one over a number of more expensive KitchenAid models because it has better value for the money you pay. It has a good bowl to beater and whip relationship which is important for efficient and uniform mixing. The beater or whip to bowl clearance and design is just right for it to be able to pick-up ingredients well. The Classic Plus works great for whipping, creaming, mixing cake batter and making cookies. A 250-watt motor gives it enough torque to knead dough for 1 – 2 loaves of bread. Overall, this mixer can do light tasks really well and tough dough just fine. Its 4.5 quart bowl has no handle, but it’s not a deal breaker if you only work with smaller quantities. A same size bowl with handle is available separately if you want one. The Pro 600 Series stand mixer is the second best-selling KitchenAid table top mixer. A motor that packs 575 watts and a bowl that holds 6 quarts of mixture put it in the class of big and powerful stand mixers. It is in the league of bowl-lift stand mixers which all bigger stand mixers belong. It’s more stable and sturdier than the tilt-head models. It made this list because it can better handle bigger amounts of denser mixtures. Its spiral dough kneads better, completes a dough cycle faster than the C-type hook and prevents dough-cling. Ingredient pick-up is better in the squat bowl of the Pro 600. This is important because content tends to form a pool at the bottom of a tall and narrow bowl. You can get a 3-quart bowl separately for mixing really small quantities. Other plus features are: all-metal gear system, auto shut-off protection, electronic speed sensor and soft start. We have provided a detailed review of the features and performance of the Professional 600 stand mixer in this site. Is this appliance a stand mixer? That was me wondering when I first saw it. I don’t see a mixer head, instead the motor is underneath. It has a high speed drive that drives the blender and a high torque drive that drives the beater, whisk and hook. The drive shaft in the middle of the 6-quart bowl is where you attach the twin whisks, and the twin cookie paddles or hook. The construct of the Bosch Universal Plus is more utilitarian when compared to most stand mixers. There is no load from overhead that it has to carry instead the motor’s weight helps keep the mixer stable. The shape of the 6.5 quart bowl promotes uniform mixing because tiny ingredient pools do not form on its flat base. This 800-watt machine can mix and knead 6-loaves worth of bread dough in a single batch. It doesn’t flinch and only gets warm not hot with that amount of load. Better yet, you can use it daily for such tough jobs. Yet, it is light enough to be moved around and doesn’t take a lot of space. It is a work horse built into a smaller and lighter frame. For small batches of dough, you’ll need a Small Batch Kneading attachment and a Dough Creep Gizmo to prevent dough from creeping into the drive shaft. They are not included in the package and are available at Breadtopia. You may find it a bit inconvenient to have to use more attachments. But the machine can’t knead small batches well. You can turn your Bosch Universal Plus into a blender, slicer, shredder, juicer or grinder with the appropriate attachment. Overall, the Bosch Universal Plus kitchen machine is a dependable tool for large and tough mixing jobs. Big surprises do come in small packages. The Bosch Compact packs a 400-watt motor in its streamlined and light frame. But don’t judge it by its size because where bigger and bulkier stand mixers fall short, this one delivers. This mixer works great for a multitude of mixing tasks…whipping, beating, creaming, etc. But can it make pizza, bread and whole grain breads? Yes, it can. You can perfectly knead dough for 2-3 loaves and you can run it for 10 – 15 minutes and it doesn’t get hot. Unlike with the Bosch Universal Plus, the mixing attachments are held on an overhead drive that folds down, and they move in a planetary motion. It is amazing what The Bosch Compact can accomplish for its size. It has three drives for various functions. The high torque drive is for mixing and kneading, the high speed drive runs the blender and food processor and the mid-speed drive drives the juicer and shredder. A big plus for this machine is it’s so compact you can easily get it in and out of cabinets. You don’t have to have a dedicated space for it. It is plastic, yes, but it’s high impact plastic and it’s steady, and it delivers. Another big plus is the value you get for what you pay. At only around $200! I mean where else can you get such value. Included in a package of Bosch Compact mixer is a 4 quart bowl, a whisk, a cookie paddle, a dough hook and a pouring shield. If you don’t make loaves and loaves of bread daily, this little machine will more than meet your needs. It’s ideal for a family of four to five. It’s still a KitchenAid on top. The Proline Series is hefty…in build, price and performance. It has a 1.3 horsepower motor and a squat 7-quart bowl. That’s enough power and capacity for heavy lifting. It trumps the rest when it comes to performing the entire spectrum of mixing tasks…from whipping small amounts of egg white and kneading dough for a single loaf to mixing batches of cookie dough and multiple batches of whole wheat bread. What is great is despite the size of the bowl it is able to pick up ingredients on the bottom. Think of it as the Bosch Compact and the Bosch Universal Plus combined. The shape and structure of the 11-wire whip goes so well with the shape of the bowl that it is able to turn a small quantity of egg white into fluffy meringues. A 5-quart bowl is available if you want one for smaller tasks. The spiral dough hook is significantly better at kneading heavy dough. It can knead for 10 plus minutes without getting hot. Compare that to the other KitchenAid models that get hot and shuts-off with extended kneading. It is not much bigger than the Pro 600 Series but it is significantly more powerful and efficient. It is sturdy, stable and doesn’t do the walk. And, it is quiet. Plus, it has an all-metal gear system, an electronic speed sensor and an overload protection. But that power and performance aren’t cheap. To top it, the KitchenAid Proline Series carries a 5 year warranty. 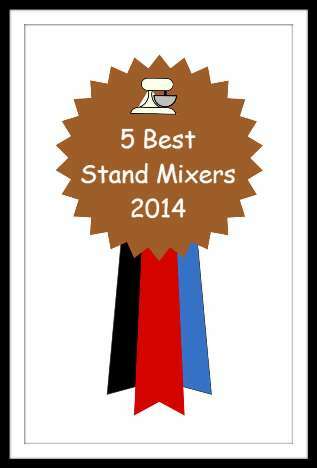 How did I narrow down my list of potential candidates for the best stand mixers of 2014? First, I chose to include only those that are for household use because it’s what majority of us use. Second, I only looked at planetary stand mixers because there is no comparison with the other type which is just a hand mixer on a stand. Type of Mixtures and Volume. How well does it mix small and large quantities? Can it handle light or heavy mixing or both? Some models do well with light mixing but can do just a bit of the heavy ones. Some can power through tough mixing but are not as efficient with the easier and smaller tasks. Stability. Does it walk, shake, strain? How stable is it? How well can it stand the force of whipping, beating and kneading? Ease of use. Are controls, buttons and knobs accessible? How easy or difficult is it to attach and remove beater, whip, hook and bowl? Warranty and Service. Does the manufacturer make it easy for customers to seek service and claim warranty? A stand mixer is a big investment. A buyer shouldn’t have to go through hoops when claiming warranty and service. Average Online Rating. The average online rating of users. This shows whether buyers have good or bad experiences with the mixer. I then summed up the scores for each stand mixer model and ranked them from highest to lowest. Price is not included in the criteria because my goal is to find the best in terms of performance. And, we all know that the best often are expensive. Where two mixers have almost the same scores, I consider the value it offers vis-à-vis its cost. Here’s how I’d pick a stand mixer from the list. If money is not an issue, I’d pick the KitchenAid Proline. It’s better to have a mixer that can do anything I may require of it now and in the future rather than need it to do something and find out it can’t. Also, it has the longest warranty at 5 years. The rest only have 1-year warranties. If I want to be able to make small and big batches of dough but want something cheaper than the Proline, I’ll opt for the Bosch Universal Plus and just get the attachments for small batches. If most of what I prepare are cakes and cookies, and 1 -2 loaves of bread, the Bosch Compact will be ideal. And, it’s the best value-for-money stand mixer in the best five. A good stand mixer is an investment. Whether you bake for your family or for passion, it’s worth spending for it if you can accomplish what you want.